When did Congress create separate judges for the circuit courts? Congress established 16 judgeships in six circuit courts in the Judiciary Act of 1801. The first five circuits would receive three judges each, while a single judge would preside over the Sixth Circuit. The outgoing administration of Federalist president John Adams wanted to strengthen the federal judicial system, particularly before the Democratic-Republican administration of incoming president Thomas Jefferson and a new Congress dominated by Jefferson’s party took office. The Democratic-Republicans repealed the Judiciary Act of 1801 in the Judiciary Act of 1802. This new law kept the structure of the six circuits but abolished the separate judgeships. The U.S. 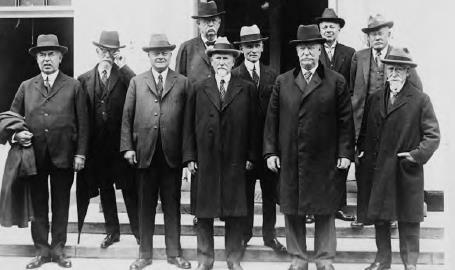 Circuit Court judges gather for a photo at a conference, accompanied by then-U.S. Supreme Court Justice William Howard Taft (fourth from right) in an undated 1920s photo (Library of Congress).